Online tutoring can overcome many limitations of the physical environment such as time, space, geographic location, etc. It also brings new pedagogical strategies and methods into the traditional forms of education. That is why digital technologies are increasingly entering into the everyday life of the traditional classroom via blended learning. increase their motivation to actively participate. to make joint classes with classrooms in another school, city, or even country. The students are gathered in their traditional classroom environment. A teacher or supervisor on site facilitates the interaction. The guest teacher is connected online to a virtual classroom using a laptop or a computer with a web camera. In order for the students to clearly see and hear the online guest, the laptop should be connected to a larger screen (multimedia, interactive whiteboard, or a TV) and speakers. The students can interact directly with the remote presenter via the video-conference connection that allows them to ask and answer questions, participate in games and quizzes, etc. The teacher can also connect a wireless microphone to the laptop so as to give the students the opportunity to talk to the guest teacher. During the virtual class the online teacher can use the virtual classroom’s whiteboard, screensharing tool, and media player to provide visuals for the learning content. Thus, the guest teacher can share a PowerPoint presentation, text files, images, diagrams, audio and video files, YouTube links, etc. The interaction with the virtual guest teacher can last anywhere from 10-15 minutes or for the entire duration of the class depending on the learning objectives and the ages of the students. For example, the teacher can invite an expert online to present a certain concept or topic at the beginning of the class. After that the lesson could continue offline with hands-on activities or discussions. Alternatively, the online guest teacher can conduct the whole class and combine various types of activities – presentations, demonstrations, discussions, Q&A sessions, exercises, games, etc. For younger students (5-10 year olds) it is suitable to connect the online teacher to the virtual classroom for about 20 minutes. The virtual guest can introduce a topic, show examples, tell stories, quiz the students, involve them in game-based activities, etc. After the online interaction the lesson could continue in the traditional environment in small groups with hands-on activities. 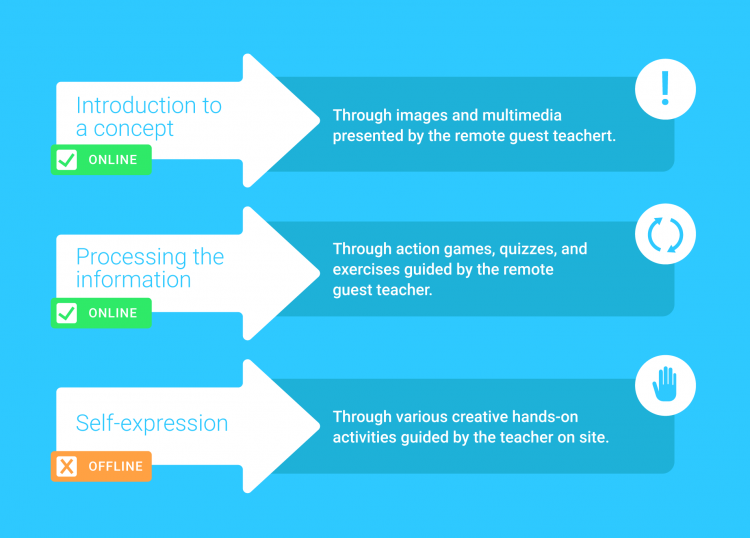 In What Types of Activities Can The Virtual Guest Teacher Be Invited to Participate? During the 2016/17 school year we conducted a study exploring the results of a “Virtual Guest Teacher” blended-learning pilot project that was held in four primary schools using VEDAMO’s Virtual Classroom. We used a project-based learning approach supported by remote lecturers. During the school year we conducted 15 classes with virtual guest teachers in each school. At the end of the pilot school year, the implementation of the project was assessed by the primary school teachers using evaluation forms according to predefined criteria. The selection of the guest teachers is crucial – they should know the age specifics of the students in order to be able to properly interact with them. In addition, they should have relevant expertise and skills to engage the students and provide them with the sufficient information they need. Close collaboration between the teacher and the online guest is of great importance. They should agree on the learning content and activities, as well as the lesson objectives and expected outcomes before the class even begins. The guest teacher should gather information about the children in the group and tailor the session to their specific needs and preferences. During the session the teacher on site should efficiently support the interactions by facilitating the communication between the online guest and the students, thus making the lesson more useful and natural. The lecture-based classes with virtual guest teachers are not well received by the children. There needs to be a greater degree of interactivity during the online sessions. Multimedia materials and the ability to communicate via video conferencing seem to be of particular interest to the primary school pupils. The children are more engaged when the guest teacher integrates action games and role plays. These activities increase the motivation and participation levels of the students. The primary school teachers shared that virtual communication was more informal and more engaging for the pupils. They were more focused on the topic during the online interactions with the guest teachers. The interactions with the online guest teacher is an activity that supplements traditional classroom learning. That is why the learning has to continue offline with practical activities and reflection so that students will test and build on their skills. The primary school teachers need additional training and qualifications so as to further improve the effective implementation of the blended learning model. The variety of activities and content representation in the virtual environment enriches the interactions with the students. The direct communication between the online guest and the students meets their specific cognitive needs. This type of interaction creates a positive emotional environment and the students are more engaged and motivated to actively participate. It saves time and money on logistics – the students are able to communicate with guest lecturers/experts from anywhere without having to travel or organize a special trip for this purpose.